Orion is the brightest and most beautiful of the winter constellations. Some of its stars, including Betelgeuse and Rigel, are among the brightest stars. The constellation Orion is perhaps the best known pattern in the night sky, rivaling the Big Dipper in fame, and the month of December is a great time for observers to reacquaint themselves with this celestial gem. Formed from a distinctive pattern of bright stars, it is full of interesting and varied objects of interest to beginner and experienced astronomer alike. Located on the celestial equator, Orion is well placed for observers in all parts of the world except in the polar regions. As seen by observers in the northern hemisphere, Orion the Hunter is represented by two bright stars, Betelgeuse and Bellatrix, marking his shoulders, and two more bright stars, Saiph and Rigel, marking his knees. His head is marked by Meissa and his belt, at a jaunty angle, by three stars in a line: Alnitak, Alnilam, and Mintaka. Hanging from his belt is his sword, with the famous Orion Nebula as its centerpiece. Observers in the southern hemisphere see Orion standing on his head, and see his belt and sword as a saucepan. The sky map accompanying this article shows how the Orion constellation is formed from its component stars. With one exception, all of the main stars in Orion are bright young blue giants or supergiants, ranging in distance from Bellatrix (243 light-years) to Alnilam (1,359 light-years). The Orion Nebula is farther away than any of the naked eye stars at a distance of about 1,600 light-years. One light-year is the distance light travels in a single year, about 6 trillion miles (10 trillion kilometers). Orion contains a wealth of double and multiple stars which can be explored with binoculars or a small telescope. Observers with binoculars should pay particular attention to three areas. First, the area around Meissa, Orion's head, is actually a small star cluster known as Collinder 69. Secondly, the right-most star in Orion’s belt, Mintaka, is a wide double star easily split in binoculars. Thirdly, the three "stars" which form Orion's sword are all totally amazing star systems, ranging somewhere between multiple stars and small open clusters of stars. Observers with small telescopes will find a wealth of close doubles and multiples. Rigel is an unusual pairing of a brilliant blue giant and a tiny white dwarf, almost lost in the glare from the primary. 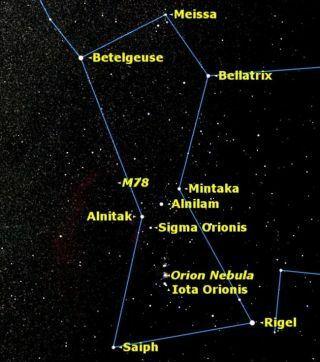 Sigma Orionis, just south of the left-most star in the belt, Alnitak, is one of the finest multiple stars in the sky. Finally, Theta, in the heart of the Orion Nebula, is a wide double which splits into a closer double and a quadruple star, the latter known as "the Trapezium." This resolves into four stars in a large telescope, with at least two fainter stars becoming visible when the seeing is really steady. The "middle star" in Orion's sword, Theta Orionis, is swathed in nebulosity, glowing from the radiation of the hot young stars it contains. This is the most famous stellar nursery in the sky. The Hubble telescope has detected a number of protostars forming in this nebula region. In a dark sky, the nebula can be seen with binoculars. In a small to medium telescope the view is truly wondrous. The nebula shows two wings, like bird's wings, enclosing the young stars in the middle of the nebula. Adding a nebula filter will bring out the mottled detail of the nebulosity, which John Herschel described as resembling "the breaking up of a mackerel sky when the clouds of which it consists begin to assume a cirrus appearance." When observing the Orion Nebula, catalogued as M42 in the Messier catalog of deep sky objects, be sure to notice the dark bay in the nebula, known as the "fish mouth," which separates it from a smaller nebulosity which Messier catalogued as M43. While looking at these Messier objects, check out Messier 78 (M78) on the opposite side of the belt. This nebula is unusual for being a reflection nebula rather than an emission nebula, lit by reflected starlight rather than glowing itself through the effects of stellar emissions. Many beginners want to look for the Horsehead Nebula, surely one of the most photographed objects in the sky. Unfortunately, this is also one of the most difficult of all objects to observe visually, requiring a special hydrogen beta filter and an absolutely perfectly dark sky. Only a handful of very experienced observers have ever seen it.